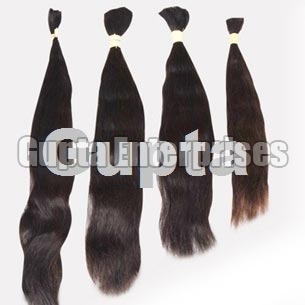 Our company brings forth a wide assortment of exceptional quality Remy Single Drawn Black Hair. The Remy Single Drawn Black Hair offered by us is hackled and trimmed on one side. Further, we make use of premium quality colors, dyes and bleaches to give dark blonde as well as light blonde shades to the Remy Single Drawn Black Hair. Also, the silky appearance and soft texture of the Remy Single Drawn Black Hair remain the same even after several washes.